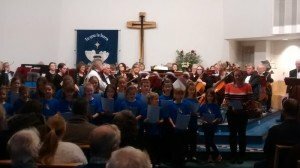 The choir once again starred in the Rotary Club concert this year at St Luke’s church in Buckfastleigh. Pupils performed some of the carols learnt for the Christmas Cantata and also for the Radio Devon Star for Christmas competition which pupils entered recently. The pupils enjoyed listening to the Newton Abbot Orchestra who were also performing during the evening.